This soldering guide explains how to build a DOUT module based on the old layout (e.g. from Mike). If you want to build a module based on the revised layout from SmashTV please continue at this page. 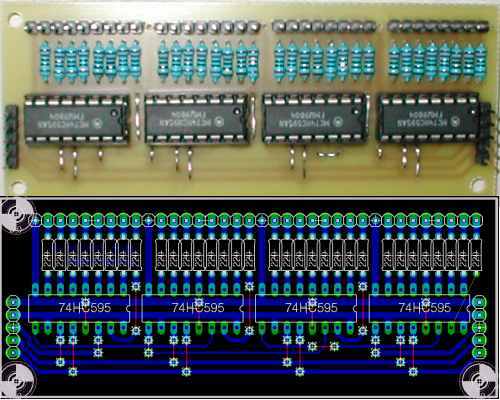 Start with soldering the 15 bridges which save you from creating a 2-layer board. You can use the cutted legs of caps and resistors, before you throw them away after you finished all the modules! :-) Note that the 5 bridges between Pin 13 of the ICs and Vss (ground) and Pin 15 -> J6:D0 will be soldered at the bottom side! Mount the IC-sockets before continuing. This picture shows the 5 additional bridges, realized with isolated cables. Add also the four additional Bypass Caps between Vdd and ground (Vss) of each chip on the bottom side of the PCB as close to the +5V power input of the 74HC595 as possible. Add an additional cap (100 uF) at the power input of the DOUT module. These caps improve the power integrity. A full stuffed DOUTX4 module within a MIDIbox64.